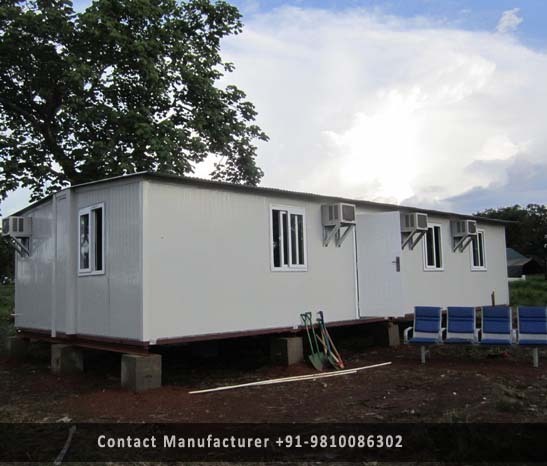 Prefabricated Emergency Shelters Manufacturer in Delhi, Prefabricated Emergency Shelters Supplier in Delhi, Prefabricated Emergency Shelters in Delhi. Being a recognized name in the industry, a company is affianced in presenting to its cherished clients a quality assured the range of Prefabricated Emergency Shelters. Offered Prefab product is designed and manufactured using high-quality material that is resistant to fire as well as heavy water making it suitable to sustain in all weather and disastrous condition. This product is designed such a way that they can be easily segmented into private areas just with the help of Prefabricated Technique. Generally used for relief work at the time of natural calamities, these shelters can be installed easily by the user to get quick and fast shelter solution in the relief area. It is manufacturing in a customized manner so that comes to customers in varied size and is designed keeping the mind the extremity and level of weather conditions of the natural calamity areas. This product can be pitched easily thus providing the maximum accommodation to the victims. Customers can avail offered product in customized designs as well.